The new website "Discover Sci-Fi," produced by ten science fiction authors, promises to offer discounts, sneak peeks and blog posts directly to readers. 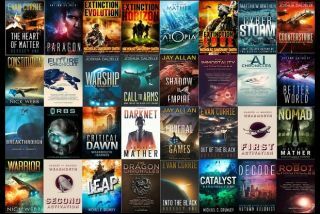 Several science fiction authors have opened up a new online platform intended to help them connect directly with readers — and it's currently offering a free e-book upon sign-up and the chance to win 40 signed novels. The website, called Discover Sci-Fi, is a joint venture of 10 science fiction authors who intend to offer deals for discounted and free books, contests, sneak peaks and inside looks into the writers' processes. It features the writers Matthew Mather, Nick Webb, Samuel Peralta, Nicholas Sansbury Smith, Michael Grumley, Evan Currie, Autumn Kalquist, Jay Allan, Darren Wearmouth and Joshua Dalzelle (as listed in an introductory email). Together, the authors have sold more than five million books, appeared regularly on the USA Today Best-Selling Books list and have optioned their books for TV and motion pictures, according to the website — right now, a bare-bones sign-up page and blog. But for fans of the authors or people interested in discovering new science fiction — or at least a free e-book — it's worth checking out.